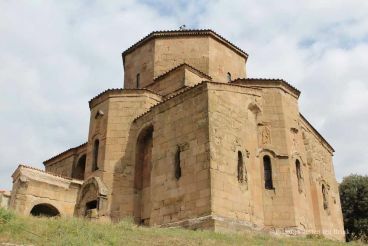 Djvari is located on the top of the mountain, at the foot of which merge the two great rivers of Georgia - Aragvi and Kura. Down on the plain stretches Mtskheta - ancient capital of Georgia. By the number of Christian relics city has no equal, it is rightly called "second Jerusalem". 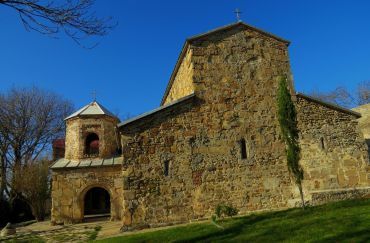 Blends harmoniously into the local scenery famous Djvari - Temple of the Cross, erected above a wooden cross put the holy Nina. The original building small temple survives to this day in the form of ruins, but the second temple, a large Djvari, reached our days almost unchanged. Strict and harmonious forms of the temple on the background of local nature look majestic and enchantingly, it is impossible not to notice. The interior of Djvari striking in its simplicity and rigor. Particular impression cross on a stone pedestal, survives to this day, in the center of the temple. 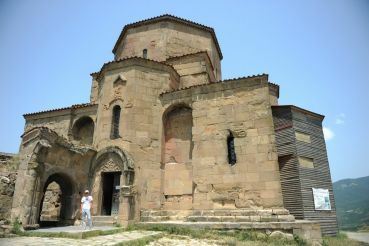 Exterior facades are decorated with bas-reliefs with inscriptions on ancient Georgian language. 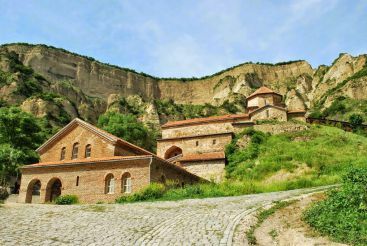 Near the temple is built viewing platform, which offers a breathtaking view of Mtskheta and its surrounding mountains. Local places of great beauty inspired the Russian poet Mikhail Lermontov, he mentioned in his poem "The Novice". At the foot of a monument to the poet. 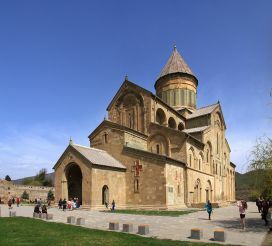 Now Djvari - a functioning monastery where still continue the ancient traditions of the brotherhood of monks. On the hillside tree grows "desires". Every visitor can tie a ribbon and at the same time to make a wish that will come true.